The yeti of the Himalayas, like the Loch Ness monster of Scotland, is a creature that over the years has had much publicity. Debate rages as to whether the low profile of the two creatures stems from shyness or because they are both products of science fiction. Most sightings of the yeti, also known as the abominable snowman, are roughly the same, an ape-like creature around the same size as a grown man. Last week an American climber, Craig Calonica, on Mount Everest became the latest person to witness this most elusive of creatures. He said that he had seen a pair of yetis while coming down the mountain on its Chinese side. Both had thick, shiny black fur, he said, and walked upright. 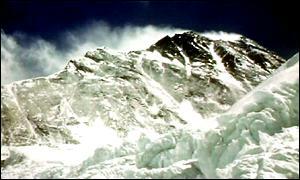 The alleged sighting has re-triggered the debate over the existence of the yeti, a creature that is revered and feared by many people in the Nepalese Himalayas. The closest most people in the West have probably come to seeing a yeti is a blurred photograph of an ape-like creature running around in the mountains. Most of these photos have subsequently been exposed as fakes. Yet if Mr Calonica is to be believed, the truth can sometimes be stranger than fiction. 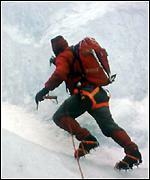 As he descended Mount Everest, he said that one of the creatures was the height of a man. "Over to my right I noticed some black arms or wings ... ripping and pulling at something," he said. " I kept watching it and I got about thirty metres away and up stood this creature that stood erect. It walked like a human, except that it had thick black fur, was about six feet tall and hunched over his shoulders (with) very long arms and extremely large hands. "And just shortly afterwards - 15, 20 seconds later - the second one jumped up except it wasn't holding anything and it was noticeably smaller. According to the Nepalese conservationist Karna Sackyar, Mr Calonica's sighting is almost impossible to prove, because 90% of the Himalayas above 14,000ft still have not been properly explored. "I have travelled a lot in my country and I have never seen a Yeti myself so I do not know whether his claim is genuine or not," he said. "But I strongly believe that taking into consideration the vastness of the Himalayan region, I just cannot say that there is no Yeti in our country." Toby Murcott, the BBC's science analyst, said that while it is most unlikely that yetis exist, Mr Calonica's sighting should not be dismissed out of hand. "I don't think the claim is far fetched," he said. "I think that he genuinely believes that he saw two yeti-like creatures in the Himalayas. "There have been many, many claims like this. What you have to be careful about is what people are actually seeing. "Did he really see two yetis or did he see perhaps two bears? Was he for example suffering from altitude sickness and hallucinating? "Its always very difficult in a one-off situation like this to prove anything." The scientific jury may be out, but Mr Calonica does have his own theories on what he saw. "Many people call them different things. I kind of have a feeling they are an ancestor of ours," he said.